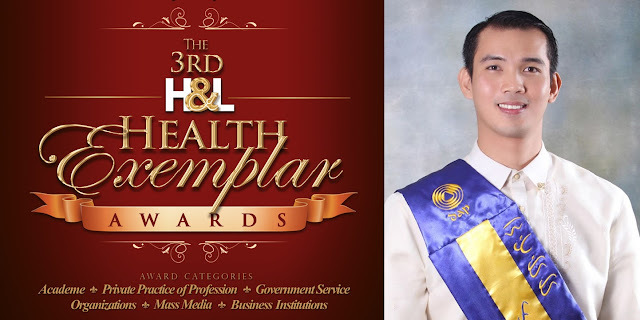 Dr. Dreyfuss Perlas, the doctor-volunteer to the barrio killed by a gunman last March 1, will be given a posthumous award during the 3rd Health Exemplar awarding ceremonies to be held at One Canvass, Chino Roces, Makati City, on March 22. The other awardees are Dr. Juan Sanchez, Dr. Richard Mata, Dr. Edgardo Ulysses Dorotheo, Dr. Iris Isip-Tan and the Mu Sigma Phi of the University of the Philippines College of Medicine. To be given special citations for their contributions to public health are Dr. Faith Guirnela-Go, Ms. Rosamy "Jing" Castaneda-Velasco and the Hepatology Society of the Philippines. Health Secretary Paulyn Jean B. Rosell-Ubial will deliver the keynote address during the awarding ceremonies. The H&L Health Exemplar Awards recognize individuals, institutions, governmental agencies, non-governmental organizations, media entities and others who have effectively carried out activities and programs that promote a specific aspect of a healthy lifestyle and health-promoting behavior which includes diet and nutrition, exercise and fitness, smoking cessation, relaxation and stress control, hygiene and cleanliness. The awardees' contributions are recognized for the positive health-promoting and health-seeking behavior they have achieved in their respective communities or the entire population. Noted medical specialists from the Medical Advisory Board (MAB) of the Health and Lifestyle (H&L) magazine compose the Board of Judges. The H&L MAB is composed of prominent physicians who are virtual who's who in the country's medical field. This year's board of judges is composed of Dr. Ramon Abarquez, Jr., Dr. Augusto Litonjua, Dr. Adolfo Bellosillo, Dr. Abdias Aquino, Dr. Bien Cabral, Dr. Willie Ong and Dr. Bibly Macaya. The posthumous award for Dr. Perlas honors his patriotism and devotion to duty as a doctor-volunteer to help our marginalized countrymen in Northern Mindanao who are in dire need of medical assistance. Despite the danger to his life, he was among the first ones to participate in rescue and medical missions during natural calamities. He was also prompt to volunteer his medical assistance during ambushes and clashes with insurgents in their area. Dr. Sanchez, a noted surgeon, is the brain behind the innovative Mobile Surgical Unit for which he has gained the moniker as the “Doctor on Wheels." He has spearheaded medical-surgical missions in many underserved areas in the country, performing various types of surgeries for free. Consistently doing these missions monthly for more than ten years now, he and his fellow volunteers have helped transform the lives of thousands of poor Filipinos. Dr. Mata has helped curb the rise in dengue cases in the country with his nationwide health education seminars and workshops for health workers and community leaders. He has conducted training for dengue coordinators on how communities can effectively do initiatives to prevent the rising incidence of dengue in their respective communities. With his unstinting advocacy against smoking, Dr. Dorotheo has been actively involved in various global campaigns for tobacco control, which has made significant milestones in public health not only in the Philippines but in neighboring countries as well. He was one of the outspoken advocates for the sin tax reform law as well as the inclusion of graphic health warnings in cigarette packages. A specialist in internal medicine and endocrinology, Dr. Isip-Tan has given true meaning to the role of a physician as a health educator and ‘influencer.’ With her expertise in health informatics, she has adeptly harnessed social media to promote health literacy and positive health-seeking behavior in the public. The first and biggest medical sorority in the Philippines and in Asia, the Mu Sigma Phi Sorority is recognized for its various projects serving indigent patients. It has also promoted a positive health-seeking behavior in the public with its healthy lifestyle and various health education campaigns such as the Women Empowerment and Literacy through Health Education (WEALTH). The Hepatology Society of the Philippines is cited for effectively addressing the lack of public knowledge on Hepatitis B which has led to misconceptions causing stigma for those who carry the virus, and to delayed treatment leading to liver cancer and end-stage liver disease. This was achieved through their scientific researches, extensive continuing medical education programs (Liver Caravan Symposia), and campaigns for newborn vaccination against Hepatitis B.
Dr. Guirnela-Go is cited for the public education forums she has helped organize in her hometown in Oroquieta City, as well as other towns in Misamis Occidental, under the auspices of the Foundation for Lay Education on Heart Diseases, (FLEHD) Inc. Without fanfare, she has conducted follow-up programs in her city to further spread awareness on cardiovascular diseases and promote primary prevention at the grassroots level. Popular broadcast journalist Jing Castaneda will be given a special citation for her strong advocacy for a healthy lifestyle and other health-promotion programs. As a veteran news personality and celebrity mom, she has extended her influence and that of her network to help people in dire need of medical assistance, particularly children who are physically abused, maltreated and require treatment for their medical ailments through the Bantay Bata (Child Watch) of which she is the program director. Through her television program (Salamat Dok), she also helps address various family issues on health, empowering the public with basic knowledge on preserving health and wellness. I am here to testify how Dr banlogun herbal medicine helped my son,my son once had the problem of hapetitis B which affected his Education for years,i gave him different medication but there was no solution,i search the net and i found the contact of a doctor,who help me with his product on curing HIV/AIDS, CANCER< HERPES, HEP B, DIABITIES, HSV, MOUTH ODOUR, STD, VAGINAL DISEASE/ ITCHING,, CHRONIC HEPATITIS,GERNITAL WARTS, HPV, EPILEPSY, OVARIAN CANCER/CYST, BLOOD PRESSURE, STROKE, BAD BREATH problem and other deadly diseases,he also assured me that it is a permanent cure,my son took the medication for just 2 weeks and he was back to normal. for two years now he has been doing fine.I give all thanks to Dr banlogun for helping me out of such problem now am the hapiest person on earth for seeing my son doing better again.you can also contact him on Drbanlogunsolutionhome@gmail.com you can also call or whatsapp on +2349032508349 or +2349053287594and get the product. Thanks to him we can now buy drugs more convenient and for the better prices. He found many good treatments that now help people all over the world. Also you can find it here https://directdrugs.to and it`s just a beginning. I like the new system they add for such online store as the possibility to pay via bitcoins.